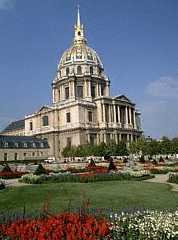 Web site: http://www.invalides.org/ (the French version is much more complete than the english version). This used to be the military hospital. Louis XIV built it in the late 1600's to house the wounded soldiers from his wars. 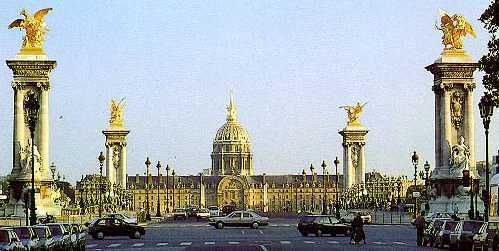 That is why you will see it referred to as the "Hotel des Invalides" - Hotel of Invalids! It still has some soldiers living there from World War I & II. The buildings were completed in five years (1671-76). The gold-plated dome that rises above the hospital buildings belong to the Church of Saint-Louis (1675-1706), designed by Jules Hardouin-Mansart. The military museum is very interesting and well worth walking through. Inside the courtyard are many old cannons. Pay attention to the way they were cast with sculptures in them. At the back of the inner courtyard there is a cannon that has a man and a woman in an embrace as the two handles. See if you can find it - there's a picture near the bottom of the page. When you walk up to the front of the building, check out the sculptures on the top! 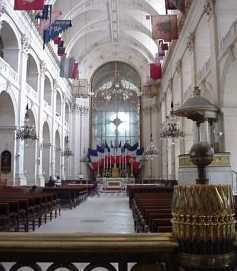 In the chapels of Saint-Louis are the tombs of Napoleons brothers Joseph and Jérôme, of his son (whose body was returned from Vienna in 1940 by Adolf Hitler), and of the marshals of France. 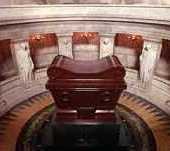 Immediately beneath the cupola is a red porphyry sarcophagus that covers the six coffins enclosing the body of Napoleon I, which was returned from Saint-Helena in 1840 through the efforts of King Louis-Philippe. 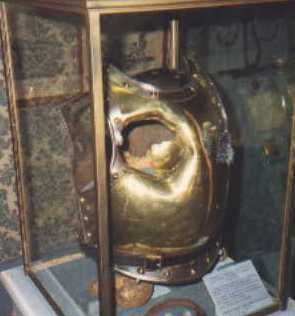 Napoleons uniforms, personal arms, and death bed are displayed in the Musée de l'Armée (Army Museum) at the front of the Invalides. In the front of the building the grassy, tree-lined Esplanade des Invalides slopes for 1,410 feet to the Quai d'Orsay and the Pont Alexandre III. The first stone for the bridge was laid in 1897 by Alexanders son, Tsar Nicholas II. 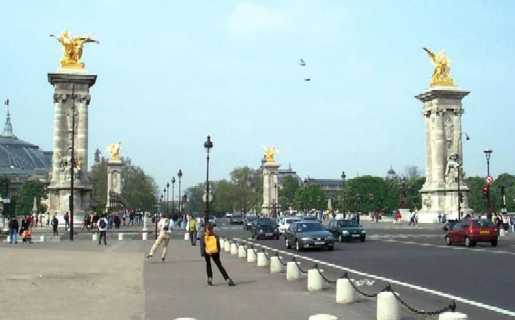 To the left is a picture of the bridge looking towards the Seine from the front of the Hotel des Invalides. 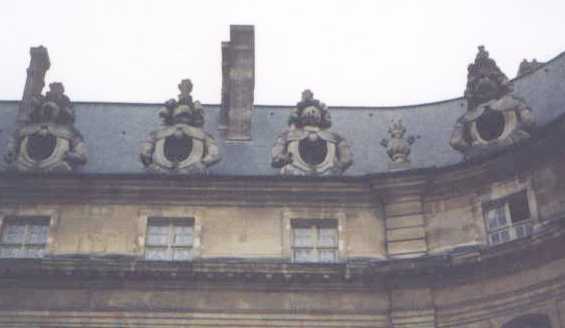 The front of the building has windows at the very top that are shaped like the shields of the soldiers that are sculpted around them. They are easy to spot if you look in the right place! 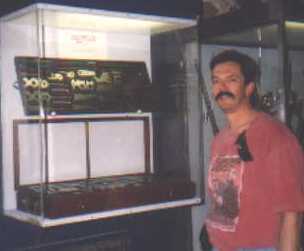 Try to find this when you tour through the Military Museum. This gives new meaning to the phrase a "bad day at the office". That's my friend Mike who travelled with me on my 2nd "business" trip to France. Mike's life is quality and he was very impressed with the old gages used for making sure the guns could properly kill people. It wasn't enough to have a big cannon. It had to be ornate too. See if you can find this beauty at the back of the courtyard before you go in the St. Louis Church! 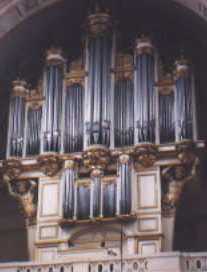 This is inside the St. Louis Chapel. It's not always open. The entrance is at the back of the courtyard. Go in if it's open and look back at the organ. Around to the back is the Dome and inside is Napoleon's tomb.